Celebrating the Century, 1980s, Personal Computers, First Day of Issue USA! During the 1980s, personal computers from companies such as Tandy, Commodore, Apple, and IBM revolutionized desktops. Home and office users could run business software, play games, or even write their own programs. 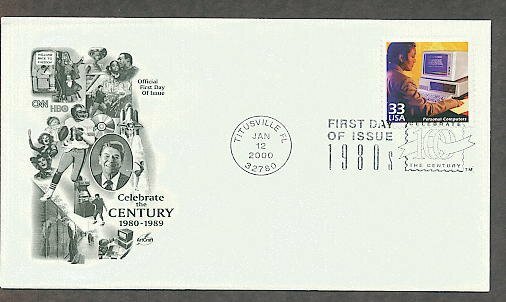 Celebrate the Century is a United States Postal Service limited commemorative postage stamp program that honors the most significant people, places, events and trends for each decade of the 20th century. Dr. Seuss, CTC, The Cat in the Hat, AC First Day of Issue USA!